We’d love your help. 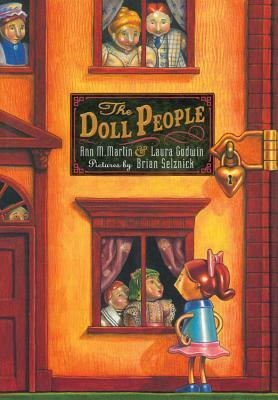 Let us know what’s wrong with this preview of The Doll People by Ann M. Martin. To ask other readers questions about The Doll People, please sign up. The Doll People is the story of a bunch of anthropomorphic dolls who’ve lived with the same real-people family for several generations. The premise of this is adorable—for freaking real, if it were my house those dolls would have been put to curbside the minute my kids had outgrown them. Who the hell keeps dolls around that long?? So the dolls have taken a sort of oath to keep secret the fact that they are alive, and if they fail in that endeavor then they enter a frozen state of lifelessness called, appropriately, Doll State. The main doll character Annabelle has to solve the mystery of her aunt’s disappearance without getting caught in Doll State, or without being discovered and carried off by the household cat. If you are looking for a story that you can share with your chapter reader that doesn't include first loves, cliques or mean girls than this is the story for you. This was a sweet, delightful and clever story about adventure, friendship and mystery. Annabelle is part of a doll set that is over one hundred years old. The set has been passed down from grandmother to daughter to granddaughter. Annabelle is curious about what happened to her Auntie Sarah who disappeared from the doll set over 50 yea If you are looking for a story that you can share with your chapter reader that doesn't include first loves, cliques or mean girls than this is the story for you. This was a sweet, delightful and clever story about adventure, friendship and mystery. Annabelle is part of a doll set that is over one hundred years old. The set has been passed down from grandmother to daughter to granddaughter. Annabelle is curious about what happened to her Auntie Sarah who disappeared from the doll set over 50 years ago. No one in her family seems to remember what happened or is willing to talk about it. When a new doll family moves into the humans house (to appease the human's younger sister who's always playing her older sister's doll set), Annabelle is excited learn the new dolls have a young daughter, too, named Tiffany. Annabelle and Tiffany both team up to solve the mystery of what happened to Auntie Sarah. This is the first book in the Doll People series, but I unknowingly read them out of order, starting with the third book which is the only one my library had on audiobook. I loved it so much that I asked for the first one for my birthday ;-) I loved it, too. Here is the story of Annabelle Doll and her family. Created over 100 years ago in England, the Doll family came to live with a little girl in America and has been passed down from mother to daughter over the years. Annabelle and her family no This is the first book in the Doll People series, but I unknowingly read them out of order, starting with the third book which is the only one my library had on audiobook. I loved it so much that I asked for the first one for my birthday ;-) I loved it, too. Still, all is not quite well in doll land as Auntie Sarah, Annabelle's aunt, has been missing for 45 years!!!! When Annabelle discovers Auntie Sarah's diary, she gains a new appreciation for the brave, adventuresome woman Auntie Sarah was (always sneaking off to explore new parts of the human's home, or to find a new species of spider to study) and a profound desire to set out to find her, much to the chagrin of her family who would much prefer to stay safely ensconced in the doll house, and for Annabelle to do the same. Here, the story takes on an unexpected complexity as the family argues and tries to come to terms with what to do about the Auntie Sarah situation. Mama and Papa Doll want to protect Annabelle. Uncle Doll is confronted with his own feelings of cowardice as he was too afraid to look for his wife before. It's the first time Annabelle has ever seen adults disagree, and the first time she has felt truly compelled to do something independent of her family's wishes. Their fears are compounded by the looming threat not only of The Captain (the human's cat) but of *Permanent Doll State* if they break too many rules of dollkind. Annabelle has been in Doll State before--slipping into an immobile condition for a day if one of the humans sees her move--but PDS is much more serious, causing the doll to lose her freewill forever! This raises lots of great conversation points if parents read this with their children. What obligation do we have to rescue others if it puts our own lives in danger? What if the person left willingly, knowing the danger, versus was lost in an accident? To what extent should adults protect their children versus allowing their children the freedom to explore? Etc. Etc. Although this book is a favorite on my bookshelves, many of my eighth grade girls seems reluctant to pick it up (by fourteen, you apparently should be over dolls, in the eyes of my students) and enthralled within the first few pages. The story about is about an old porcelain doll family who is bombarded with the arrival of a new plastic doll family, who do not respect their "dated" ways of life and The Doll Code of Honor. This brought to my mind memories of my mom forcing her old Chrissy doll (I Although this book is a favorite on my bookshelves, many of my eighth grade girls seems reluctant to pick it up (by fourteen, you apparently should be over dolls, in the eyes of my students) and enthralled within the first few pages. The story about is about an old porcelain doll family who is bombarded with the arrival of a new plastic doll family, who do not respect their "dated" ways of life and The Doll Code of Honor. This brought to my mind memories of my mom forcing her old Chrissy doll (I think her name was) on me. I hated the way her eyes were painted on and the funny yarn-looking hair she had. I found myself sidetracked often thinking about my doll days and how much imaginative energy goes into playing with these toys. Like so many other personified toy stories, I feel that one of the reasons this book appealed to me so much was my constant connection back to creating interactions with my own dolls. Our textbook relates this idea to the concept that if we are making our toys talk like people, as readers, we are interested in seeing these toys talk on their own (without our direction). I compare it to the curiosity we all have about what our toys our doing when we are not around; a theme also present in books like Corduroy and Toy Story. If you are looking for something in depth and intellectual, this isn't the book for you, but if you are weary, tired and simply wanting something smooth, delightfully creative, imaginative and unique, then by all means, take a journey through doll land where magic occurs. A porcelain family of dolls have inhabited an antique doll house for four generations. They come alive during the day when the house is empty and at night when the house is quiet. There are funny adventures, both inside the doll If you are looking for something in depth and intellectual, this isn't the book for you, but if you are weary, tired and simply wanting something smooth, delightfully creative, imaginative and unique, then by all means, take a journey through doll land where magic occurs. There are funny adventures, both inside the doll house where the 100 year old family bangs away at a old fashioned wooden piano singing Aretha Franklin's Respect sockittome. sockitome, sockitome and outside the doll house where they hesitantly wander down the dark halls, sneaking under the sofa, hiding from the family cat who is ever lurking to catch them. The book is uniquely illustrated by Brian Selznick and would not be as wondrous without the stunning creative art work. When the young daughter of the real life people family receives a gift, the 100 year old doll family meet a brand new, modern, adventurous plastic bunch of characters who are not as rigid, up tight or breakable. The author delightfully intertwines the personalities and the cultural differences of the older and modern doll family members. This book is one of my favorites from when I was younger. I love the mystery of trying to find Auntie Sarah and all of the adventures that Annabell goes on to find her aunt and get around the house. Annabell is a doll, who has been passed down in the same family for generations. Fifty years ago, Auntie Sarah disappeared and Annabell's doll family has never found out where she disappeared to. When another doll family moves in, Annabell befriends the daughter and they decide that Annabell needs to This book is one of my favorites from when I was younger. I love the mystery of trying to find Auntie Sarah and all of the adventures that Annabell goes on to find her aunt and get around the house. Annabell is a doll, who has been passed down in the same family for generations. Fifty years ago, Auntie Sarah disappeared and Annabell's doll family has never found out where she disappeared to. When another doll family moves in, Annabell befriends the daughter and they decide that Annabell needs to solve the mystery of her aunt's disappearance. We really liked this, but were sort of weirded out by it. Plus, an ongoing weird thing would happen where, toys that make music would go on mysteriously in the middle of the night. Throughout my daughter's childhood... it would happen now and then. This one ball with knob-like things sticking out that was really loud, and this one horse with a purple mane.. So, given that, we were perhaps a little bit sensitive. Anyway, great book, the sequel as well. A bit dark, but still..
My 8yo daughter loves these books and insisted I read this, so I really can't rate it any lower, right? There is a house of dolls, but not just any kind of dolls they are alive. Humans don’t know this but when they are away they can talk, walk, read and do just about anything that you could think of. There is one doll who has a secret that no one else knows, and her name is Annabelle. She has 7 people in her family, one is a nanny. Her aunt and uncle live with her and her family. Auntie Sarah has been missing for many years and Annabelle has always wanted to find out what happened to her. One day when they had time to wonder about their doll house Annabelle found that there was a hidden book in the book shelf. It was Auntie Sarah’s journal. This could lead to where Auntie Sarah disappeared to Annabelle thought. She didn’t tell anyone in her family that she had found her journal. when Annabelle was alone she would read it. Annabelle asked Uncle doll to come with her to find Auntie Sarah. So one night they sent out to find her. They came upon a box of other dolls and they were the Funcrafts. They became friends with them. They tried again to find Auntie Sarah but they had no success. Annabelle kept reading through the journal and she found out that Auntie Sarah went on an adventure to the attic and never returned. They went searching there, but the first time they could not find her but the second time they did. Their family was finally back together again after so many years of being apart. I give this book 5 stars because it is a-ma-zing. It tells me that dolls are people too, st the beginnig when Mr. Judd gave me this book, I thought it was for babies! But no way, it is amazing! It is a gorgeous story. At Kate's room lied a 100 year old doll house which loved a very curous little girl, Annabelle. She and her family were very scared of humans because they did not want to enter Permanent Doll State, which is when a doll shows herself to a human and then the doll dies and have no life. The family was Papa, Mama, Uncle Doll, Nanny, Baby Betsy, Bobby, Auntie Sarah, and Anabelle. But, a long time ago a misfortune happened. Auntie Sarah disappeared, and no one ever looked for her. That is when, one day Anabelle was looking through the shelves, and sehe found a very dusty and old journal, and it was her aunt's! Anabelle wanted it to make it secret, whnes she read it she learned a bunch of stuff from her aunt that no one knew, at least, she thought no one knew. One day, when Anabelle thgought she had read enough, she decided to explore the Human's house to see if they find Auntie Sarah, but they did not find her, they found some other dolls! She met a girl doll called Tiffany, she by the time became Anabelle's BFF and they created a detective group called SELMP. They looked and looked, will this treacherous mission will be accomplished? Well it is up to you to know! Doll people is a fantastic book that explores the adventures of Annabelle the doll and her secret life. Annabelle keeps us in suspense as she dabbles in some dangerous business and threatens her own "permanent doll state." I literally could not put this put down as I read it. I have always been a huge fan of Ann Martin, but this collaboratively written novel is an excellent new tale. It enlightened me to a new style of writing that I had never read from Ann Martin before (I read the whole babysi Doll people is a fantastic book that explores the adventures of Annabelle the doll and her secret life. Annabelle keeps us in suspense as she dabbles in some dangerous business and threatens her own "permanent doll state." I literally could not put this put down as I read it. I have always been a huge fan of Ann Martin, but this collaboratively written novel is an excellent new tale. It enlightened me to a new style of writing that I had never read from Ann Martin before (I read the whole babysitters series). I loved the clever use of personified toys and feel like so many of my girls would really enjoy reading it. After the movie Toy Story, I think children's imaginations were heightened even more than before to the idea of toys leading a secret life. I always loved dolls as a child and feel like this book. would have really intrigued me. 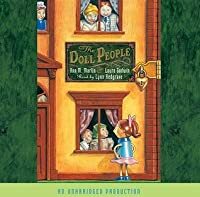 Original, creative and filled with stunning illustrations, The Doll People is a great book for children with a lot to offer, including a colorful cast of characters, vivid imagery and a large amount of vocabulary. It's nostalgic too, Martin also brought us Babysitters Club Collection #1 in the Nineties and her style is clearly visible in the text. We follow Annabelle Doll, a china doll who lives with her family, the Dolls, in a dollhouse in the bedroom of a girl named Kate. Annabelle has been eight for a hundred years, and recently, when our story begins, she is beginning to feel restless and unsatisfied with the life she is living. Enter the Funcrafts, the family in the dollhouse that is to be given to Kate's sister Nora. Tiffany Funcraft is Annabelle's age, but she is made of plastic, and thus not nearly as fragile as Annabelle. The two hit it off immediately, and throughout the story, we really see their friendship blossom. And the overarching plot is that of Annabelle determining to find her Auntie Sarah, who has been missing for fourty-five years. Her family seems afraid to go out after her, fearing Permanent Doll State. But Annabelle is sure that she must find her missing Auntie, and now she has Tiffany to help. Overall, this story had me grinning the whole time from sheer cuteness. I loved the explanation of Doll State and everything involved with it, I loved the having to get back in the position Kate left them in, and the studies of spiders. It was magical, adorable, and I would definitely give it to my daughter if I had one. Kisah tentang keluarga boneka porselen yang diturunkan dari generasi ke generasi selama lebih dari 100 tahun. Setiap boneka melakukan perjanjian untuk menjaga rahasia bahwa mereka hidup, demi keamanan jenis mereka tersebut. Namun, ada boneka yang tak bisa hanya diam di dalam rumah, mereka haus petualangan, tetapi harus melakukannya dengan cara yang aman, sehingga manusia tidak curiga. Dalam kisah ini, keluarga boneka porselen mendapatkan tetangga baru, yaitu keluarga boneka plastik yang lebih mod Kisah tentang keluarga boneka porselen yang diturunkan dari generasi ke generasi selama lebih dari 100 tahun. Setiap boneka melakukan perjanjian untuk menjaga rahasia bahwa mereka hidup, demi keamanan jenis mereka tersebut. Namun, ada boneka yang tak bisa hanya diam di dalam rumah, mereka haus petualangan, tetapi harus melakukannya dengan cara yang aman, sehingga manusia tidak curiga. Dalam kisah ini, keluarga boneka porselen mendapatkan tetangga baru, yaitu keluarga boneka plastik yang lebih modern. Annabelle Doll dan Tiffany Funcraft langsung menyukai satu sama lain dan bertualang bersama mencari Auntie Sarah Doll yang sudah hilang selama 45 tahun. Berbagai petualangan, ketegangan, bahaya, dan suka cita mewarnai malam-malam yang mereka habiskan saat keluarga manusia terlelap. I recommend this book to a fifth grader. This book was about a doll family that is alive and a doll Annabelle that goes on adventures to find her aunt that went missing forty-five years ago. At the end of the book she does find her and takes her to her family and there house so they live happily ever after. This is a cute children's book. Always imagined as a kid, what my dolls did when I wasn't home. Enjoyed this book, and am starting book 2 tonight! This book was so delightful. I got it with the intent to read it to my boys, but we were busy reading other stuff together, so I read it myself. So cute! Kind of a Toy Story meets Little House on the Prairie meets Nancy Drew. 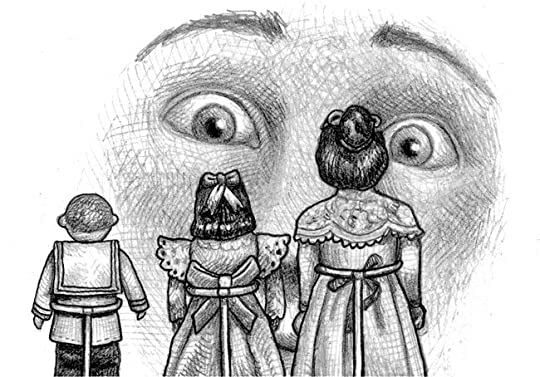 I've always liked Ann M. Martin, and I also love Brian Selznick's illustrations. If you have young kids (or like me, LOVE toys), you and your kids will probably love this book. Cute story. Read outloud with my children aged 3-15. WE all had fun seeing what the dolls got into and the adventures they had. Cute for friendship too. I loved this book! I loved the fact that not every book has to have people in it and this is a great example of that! The fact that all the dolls came to life was like they were mini people so I'm guessing that's why it is called "The Doll People" because it describes doll people. This was just as tender and sweet as I remember when I read this in third grade. This book provides wonderful nostalgia and makes me so happy whenever I think about it. The Doll People features the delicate china doll family that have been passed down through generations over one hundred years. The real secret is that the dolls come alive when their owners leave the room. The Doll family is comprised of Mama, Papa, Uncle, Auntie Sarah (who went missing in 1955), Nanny, Bobby, Baby Betsy (who came This was just as tender and sweet as I remember when I read this in third grade. This book provides wonderful nostalgia and makes me so happy whenever I think about it. The Doll People features the delicate china doll family that have been passed down through generations over one hundred years. The real secret is that the dolls come alive when their owners leave the room. The Doll family is comprised of Mama, Papa, Uncle, Auntie Sarah (who went missing in 1955), Nanny, Bobby, Baby Betsy (who came from another doll set by mistake and is bigger than her family), and restless Annabelle. The little girl who owns the dollhouse loves her toys and takes special care of them, unaware of their secret lives. Her little sister is too rowdy and gets her very own plastic doll family, the Funcrafts. This book is about the friendship struck by Tiffany Funcraft and Annabelle Doll. This book had surprisingly deep themes regarding family dynamics, grief, innovative thinking, and loyalty. I just have such a special place in my heart for this book, I can't help but love it. I liked the lore of the secret world of dolls. Whenever a doll was either handcrafted or manufactured, they were given an oath to protect the doll code. They recited a promise to protect their livelihood or else they would become a regular doll. I was intrigued by if a human was suspicious of a doll, that doll would enter Doll State for 24 hours. They would lose their ability of movement, thought, and speech. If a doll broke that code severely, they would enter Permanent Doll State and be stuck that way forever. I know its just a story, but it gave me chills every time I would read that phrase. I also chuckled when the author made a joke about Barbies. "Kate's fourth Barbie, this one with long chestnut colored hair, sat on the floor next to him, smiling quizzically. Annabelle pointed to the Barbie. "Permanent Doll State?" she asked Uncle Doll. "No. Didn't take the oath. Barbies never do." So fun to read this aloud yet again. Loved introducing Gwen and Alec to this story and characters. Gwen enjoyed it and Alec kept asking for me to read "the baby dolls" to him! And he sat on my lap and listened to much of it with us. Listened to the audio book with Emma and Will. They didn't want to stop, finished it in two days! Then we listened to it a second time, in two days again. Fun story! Recommends it for: Anyone who has ever wondered if dolls can be real. Ever since I was a little girl and had a dollhouse that my father built, I used to imagine that the dolls were real. This book brought me back to my childhood and the wonderful memories of that dollhouse. The story tells of an daring doll and her adventures to find her aunt (also adventuresome) who had gone missing. Of course, all of the doll's activities have to happen when the people are gone or asleep. Read about Annabelle and the other dolls in the family as they travel through the house looki Ever since I was a little girl and had a dollhouse that my father built, I used to imagine that the dolls were real. Read about Annabelle and the other dolls in the family as they travel through the house looking for Auntie Sara. Ann M. Martin's The Doll People is a great book. Annabelle Doll is eight-years old - has been since she was made, over 100 years ago. Part of a family of eight, Annabelle spends her days being played with, avoiding "The Captain" (her owner's cat), and most of all, avoiding being seen as alive by any human beings. When Annabelle discovers the journal of Auntie Sarah, who has been missing for the last 45 years, she decides to find out what happened to her. The fantastic adventures of Annabelle and Ann M. Martin's The Doll People is a great book. Annabelle Doll is eight-years old - has been since she was made, over 100 years ago. Part of a family of eight, Annabelle spends her days being played with, avoiding "The Captain" (her owner's cat), and most of all, avoiding being seen as alive by any human beings. When Annabelle discovers the journal of Auntie Sarah, who has been missing for the last 45 years, she decides to find out what happened to her. The fantastic adventures of Annabelle and her new friend Tiffany Funcraft are unique and humorous. The story is imaginative and delightful, and I really enjoyed reading it.